The Best place to start the “Best of Brooklyn” page is with the Italian influence in the borough, Basta! According to the American Community Survey, people of Italian ancestry are the borough's largest ethnic group and make up 6% of the population. That translates into almost 160,000 Italians and Italian-Americans. That said, there are more folks with Italian roots in Brooklyn than the entire populations of the Italian cities of Salerrno or Syracuse. 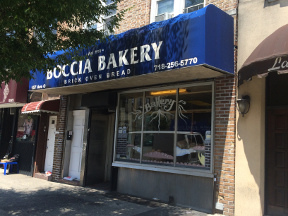 The cultural influence of Italy can be felt, seen, smelled, heard and tasted in many Brooklyn neighborhoods such as Bensonhurst (Brooklyn's Little Italy), Bergen Beach, Cobble Hill, Carroll Gardens, Dyker Heights, Bay Ridge, Williamsburg and Mill Basin. 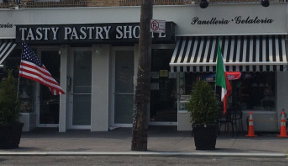 Over the past 30 years, Italian bakeries have been closing up and disappearing in neighborhoods like Park Slope and even some in Bay Ridge. The reason is gentrification. As Manhattan became more expensive, Brooklyn received the spill over of folks looking for affordable housing. Housing prices have been exploding here in Brooklyn as well thanks to Russian and Chinese billionaires laundering their money in real estate deals but that's definitively another topic. 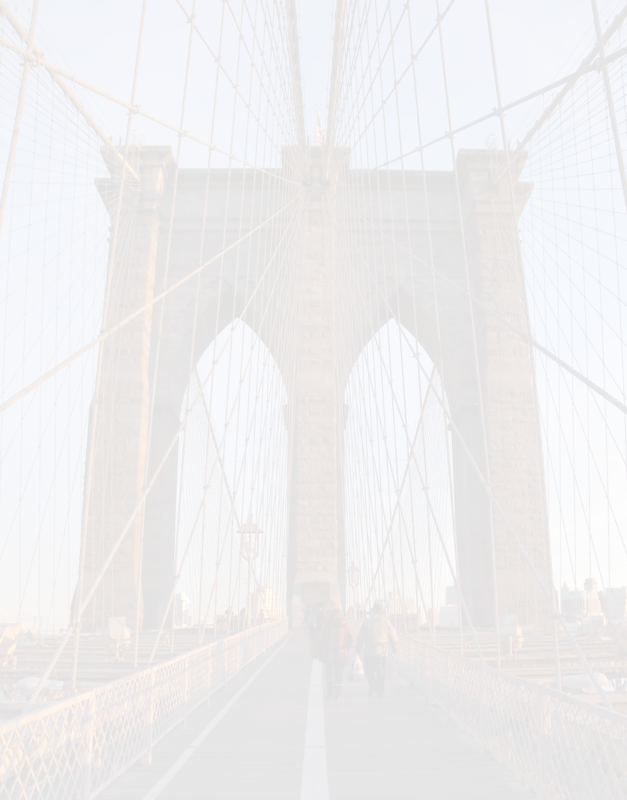 While the result of the changing demographics of Brooklyn has been a loss of some home grown enterprises, the ones that have remained can be really special. Maybe it's Darwinism at work. This recently renovated establishment is a jewel in Dyker Heights. We found it right before its renovation so there is no history of what it was like before but the hamburger cup cakes brought us back. The Tasty Bakery does everything from wedding cakes to prosciutto bread, a particular favorite of mine. For those who are uninitiated, prosciutto bread is like a ham and cheese sandwich baked into a loaf of bread. While I tend toward a vegetable based diet today, prosciutto bread is a treat from my youth that I can't resist. By the way, check out the “popcorn cup cakes” too. Alliotta pastry shop is a recent discovery. Clearly this place has been around forever. I can vouch for the “Almond Biscotti,” It's absolutely authentic (and good). The flower decorations on some of the cakes were eye popping! The Moretti Bakery makes bread and the two stores seem to be tied. There is lots of good neighborhood spots so we will limit our listing to just those pizza restaurants that have exceptional or original qualities. Please feel free to send us an email to phil@kermitplace.us with your offering for this list. (✯ ✯ ✯ Legendary) This is, without a doubt, our favorite pizza! While their round Neapolitan is rather ordinary, the square "Sicilian" slice is an original creation without comparison. This is a thick crust pizza that is baked twice. The dough is spread into the baking pan and topped with mozzarella. It is baked, melting the cheese and allowing the dough to rise. It is pulled out, allowed to cool, topped with a light tomato sauce (for a while it was flavored with a hint of anchovy), and put back into the oven to finish. The crust is dark and crunchy, the flavor is light and subtle and the texture is out of this world. 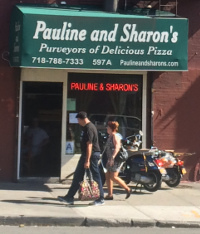 (✯ ✯ A Cut Above) Pauline & Sharon's is on Brooklyn's 4th Avenue near the entrance to the Prospect Expressway at 17th Street. We were fascinated by the name and went in looking for Pauline or Sharon soon after it opened. 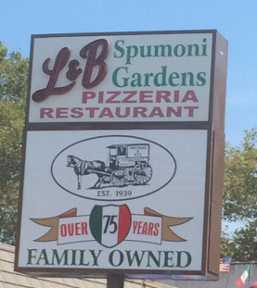 Instead, we found a pizza maker who explained that the place is named after his grandmothers. If you look on Yelp you will find, in general, very good reviews of the pizza and very funny comments about the guy working the oven. We can confirm that customer contact can range from business like to gruff (check the sign on the wall warning against asking for credit) . Another strange aspect of this pizzeria is its hours. 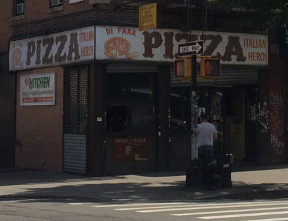 Since we drive by this place all the time we can never depend on being able to grab a slice; Yes this guy makes pizza when the mood strikes him. Maybe that's why it's so good! 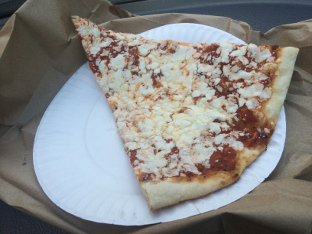 The slices are enormous and they vary in style from time to time. Its definitely worth a try. 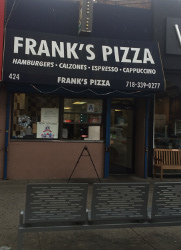 (✯ Great Neighborhood Pizza) This was our neighborhood pizzeria when we lived on Ocean Parkway and Avenue “P.” Frank's is a real Italian place because: (1) the TV is always tuned to a soccer game, not baseball, (2) his wife helps out in the kitchen, (3) Frank can somtimes talk loudly (yell) in Italian. This place makes the list because of the attention to detail and the fresh basil leaves in the sauce.